"Home stay home." Universal has debuted a new TV spot to promote the Olympics featuring footage from the new animated version of The Grinch. We still haven't seen an actual trailer for this movie yet, so this is our first look and it's a fun 30-second spot showing off the furry green character. 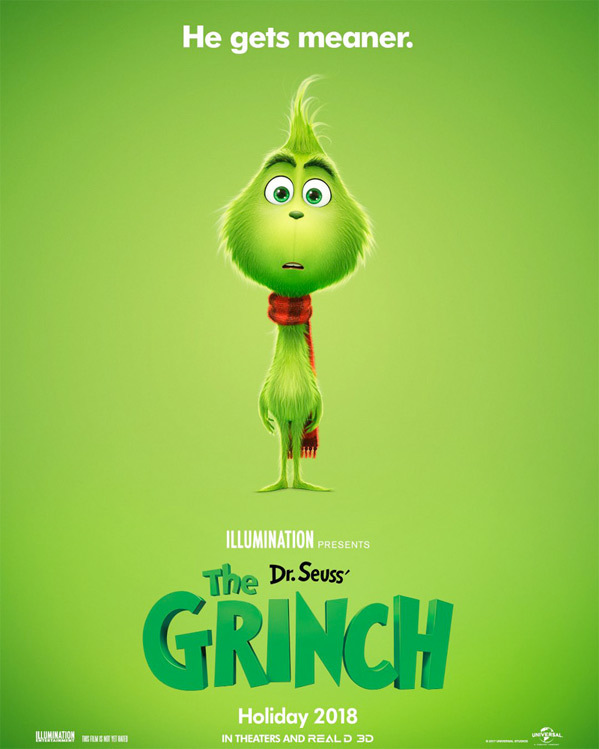 This version of Dr. Seuss' The Grinch is being made by Illumination Entertainment (of Despicable Me, Minions, Pets, The Lorax) and stars Benedict Cumberbatch as the voice of Christmas meanie The Grinch. No other official voice cast has been revealed yet. The footage is all themed specifically for the Olympics and likely won't show up in the actual movie, but at least it's something to start with for now. I'm also not sure why the teaser poster shows a very young Grinch - perhaps we'll see his origin story in this, too? We'll have to wait to find out. For now, check out the new TV spot below and enjoy your first look at The Grinch movie in theaters this November.